and feel the warm sand between my toes. 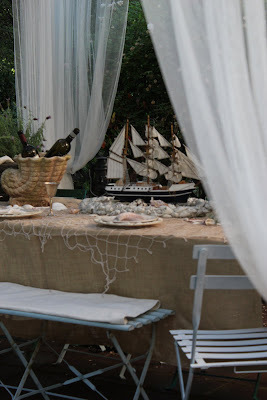 I draped the table in burlap & added the fishing net. I used 2 pieces of it to cover the 9' long table. but you can use it in so many places. note tucked safely inside when they washed ashore long ago. 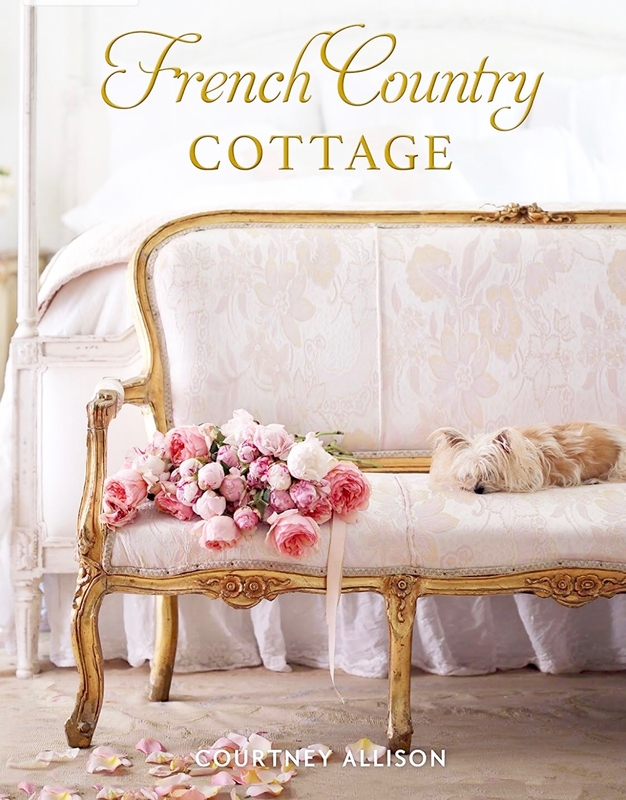 A little seaside cottage charm for a Summer table. What a beautiful table, Courtney! And it think it was all inspired by a dollar store item! Love it! I cant believe you found the fishing net at dollar tree! I'm having a surfer party for my son in a couple weeks and a few of those will be perfect to add to the decor! thanks for sharing! I'm so going this weekend! 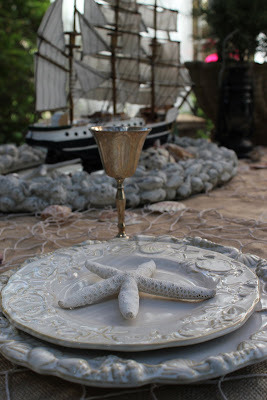 Courtney, great seaside table setting. Love the netting. My stuff is from Dollar Tree, too. I guess we are sending them some business. BTW you have to go into edit html to add that button. What time should we come over and can I bring anything? Courtney, I love this table setting! Its so pretty! I can almost year the waves crashing! I love, love this table! The dishes are great! Very pretty! Picture Perfect! Wish I lived on your block! I'll be over later for some blue mermaid margaritas!! Very beautiful! I love using burlap for a tablecloth, I made one out of it for my dining table for Thanksgiving once. Awwww, looking good! 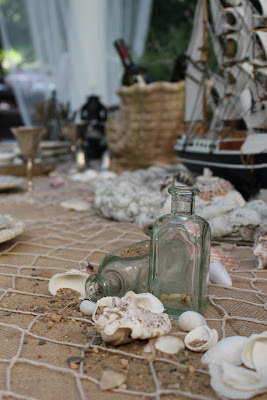 Love the beachy theme elegance! And to think it started with the Dollar Tree!! Too Funny!! Courtney, Your seaside table is so gorgeous! The dinnerware..oh my! You have taken beach dining to a whole new level. Beautiful! Courtney - you should go in to interior design or something, girl. You always know how to put things together to create a warm, cozy, inviting feeling! LUV your table! When's dinner.....? I love it Courtney, so creative. 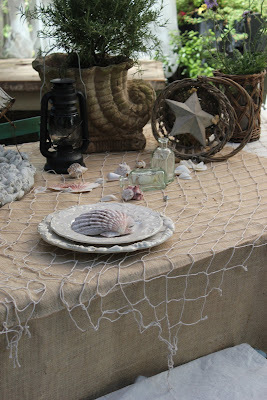 i love a seaside table -inspired by a fishing net...gorgeous! love the little bottles too- i'm obsessed with them! totally beachy! really cute Courtney! I feel like I just visited the beach! Thanks for taking me away momentarily! Love your table and your creativity is awesome! So pretty! Love your tablescape! The perfect beachy feel. Thanks for sharing. Ohhh my gosh, Girlfriend...I just giggled as soon as I seen this post. I have posted the very same dishes today! Hehe! Wowzer!!! This table is GORGEOUS, my friend! It looks sooo dreamy out on your porch with those beautiful sheer drapes gently blowing in the background...love, love, LOVE THAT!!! 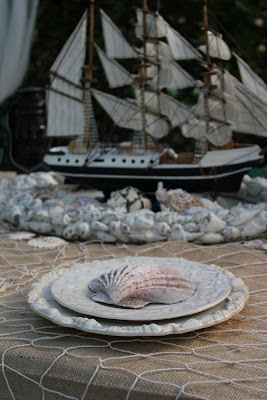 And...I love that you used your burlap tablecloth with this set of shell dishes...it really is perfect! but I must tell you...adding the net...is genius! That just took your table "over the top", sweet friend! I will have to make a trip to Dollar Tree to find one! What a fabulous table...I love it all! And...it's sooo very romantic!!! Thanks for sharing this with us...such a delight!!! What an incredible tablescape you created Courtney! I love that you layered the netting over the top and all of the details are just incredible. Great job! Love the net..., and how you scattered the shells and sand!! Just so pretty Courtney. Gotta love the Dollar store. You never know what kind of inspiration you can get from there. 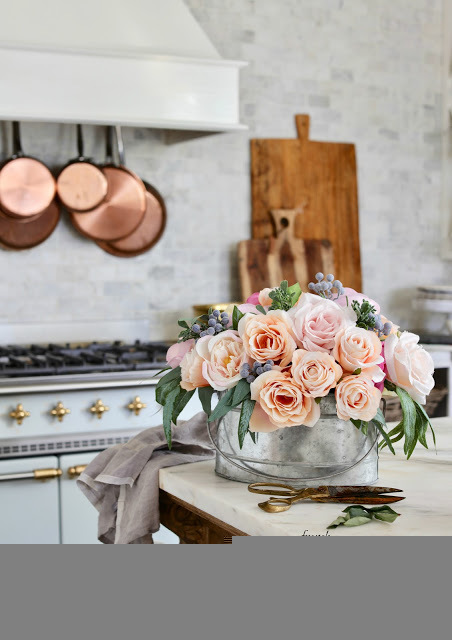 I love every little detail... and those dishes are just fabulous! I love your model ship too... definitely on my list of things to find... if the price is right! 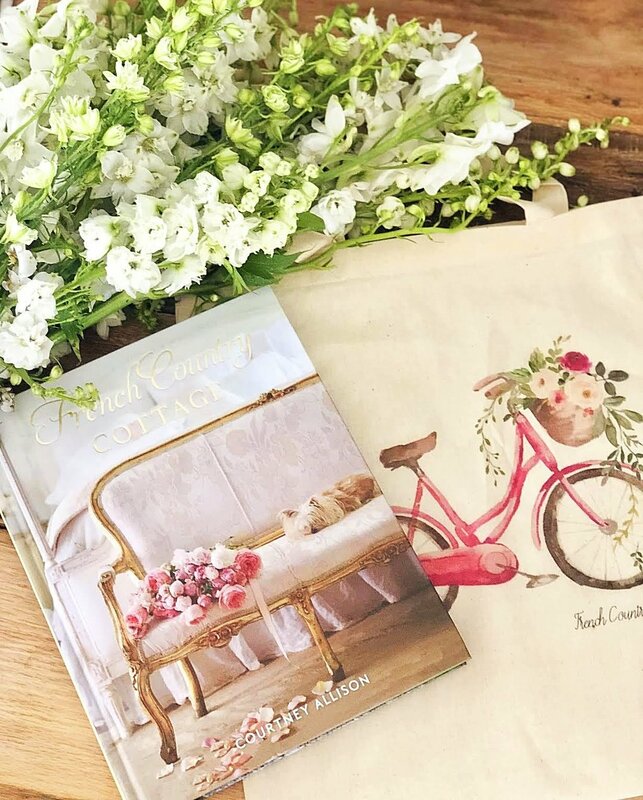 Hi Courtney, I love,love your tablescape! 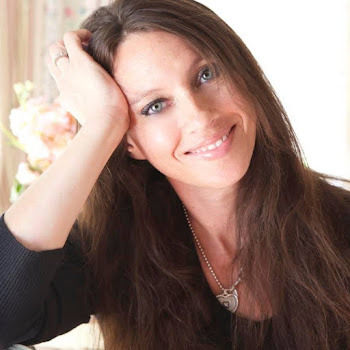 Thanks for stopping by my blog and leaving the nice comment. Beach stuff! Yay! Darling dishes.